The active table screen function shows restaurateurs the status of all currently active tables, allowing you to manage covers more efficiently, and also to give improved service to your customers by ensuring they are not kept waiting longer than necessary for a table. 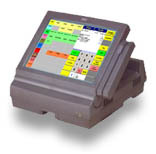 The screen displays name, covers, current balance, duration, current status (i.e. starters, main course or desserts) and cashier. Table management procedures (e.g. split table and transfer table) are also included. A comprehensive integrated booking system linked to the active table management allows tables to be reserved in advance and enables you to specify unique customer preferences, such as birthdays, anniversaries or surprise parties, offering your customers a more personalised experience. Deposits received, refunded and redeemed are also handled. Detailed table planner/organiser which can maximise covers per sitting. Customer balances can be tracked from bar to table, to room, to front-end desk systems so you can now track all customers balances for the duration of their visit. For example - your customer can have an ongoing tab from bar to restaurant to hotel room. Balances held in software. Ideal for membership clubs, associations.